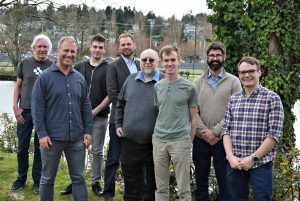 The BluHaptics team (from left): Steve White (BSEE ’85), Don Pickering, Griffin Downs, Luke Wissmann, Howard Chizeck, Ryan Cox (BSEE ’15), Andy Stewart and Fredrik Rydén (Ph.D. ’13). BluHaptics, the software company pioneering new solutions for telerobotics, has secured new funding from the National Aeronautics and Space Administration (NASA) to apply its software to remote robotic operations in space. The funding was a part of NASA’s $49.9 million investment in the latest round of Small Business Innovation Research (SBIR) grants and Small Business Technology Transfer (SBTT) grants. Those selected were considered top submissions for technical merits and feasibility. BluHaptics’ software addresses some of the current challenges of robotic use in space. Because of a reliance on remotely operated robots for general operations in space, the software must perform with control and precision. Through advanced applications of real-time modeling, force feedback and machine learning, BluHaptics’ software gives users better control over remotely operated robots. The functionality of the software ranges from general maintenance to high-risk scenarios. It has applications in satellite and Space Station repair and maintenance, lunar and Mars programs habitat construction and astronaut life support system assurance. BluHaptics has grown significantly since its origins at the University of Washington Department of Electrical Engineering. The startup was founded by UW Electrical Engineering Professor Howard Chizeck and then doctoral student Fredrik Rydén (Ph.D. ’13). The company grew out of the work Chizeck and Rydén were conducting on haptic interaction, which relays forces, vibrations and motion to operators of robotic systems. Rydén is now Chief Technology Officer for BluHaptics. He and other researchers at the company have integrated advanced applications of the software’s core technologies, creating the next generation of software for telerobotics. The design of a more user-friendly, visual interface has fueled its trajectory to space operations. Last year, BluHaptics received a Phase II SBIR grant from the National Science Foundation to develop the company’s remotely operated vehicle (ROV) piloting software for subsea operations. The commercial release of this application for underwater manipulator arms will launch in summer 2017. This article was adapted from a recent press release.